Top Trumps brings you the kings and queens of the road in their shiny gear. 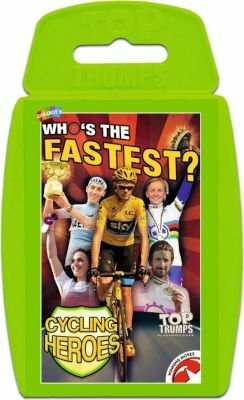 Challenge Froome against Contador, find out how Cavendish trumps Super-Wiggins and discover who’s awesome enough to win races on just one leg! Old school legends like Merckx, Anquetil or ‘Big Mig’ Indurin roll alongside the new talent of Peter Sagan and Bryan Coquard in this wheelie good, new pack!